On Friday, January 18, just before 5 p.m., a parent was picking up a student from the Empire State After School Program when her 1-year-old daughter stopped breathing and became unresponsive. As another parent buzzed into the building, Ms. Anderson noticed the commotion just outside the door and became aware the baby was in trouble. Without hesitation, Ms. Anderson stepped in, directing another staff member to call 911 and immediately performed CPR, which she continued until the paramedics arrived. The baby was transported to Samaritan hospital and ultimately to Albany Medical Center where she was admitted and treated. 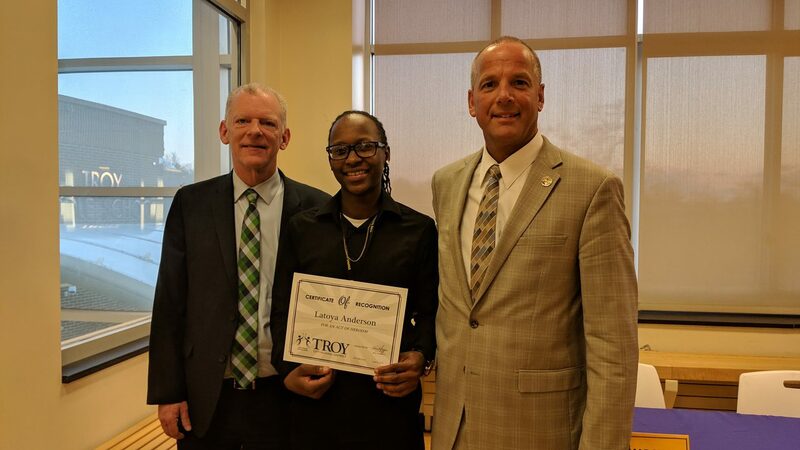 Because of Ms. Anderson’s ability to remain calm in a dangerous, life-threatening situation, and given her ability to act quickly to administer CPR, a young girl is alive today. The family of the baby has expressed their tremendous gratitude to Ms. Anderson. And, tonight it is our honor and privileged to also publicly recognize and thank her for her great act of bravery on that day and for all the she does to serve the students and families of our District every day. On behalf of the Troy City School District Board of Education, we extend a heartfelt “thank you” to you, Ms. Anderson!